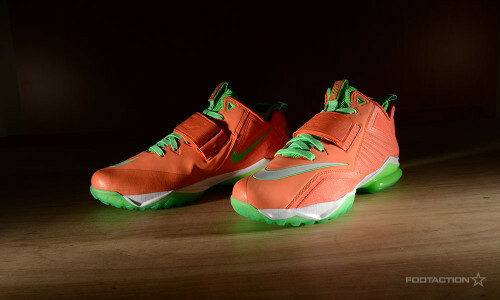 Amidst the NFL Draft Day drama, the Nike CJ Trainer 2 appears under the radar while the shoe itself could never be classified as such. The shoe splashes orange onto the synthetic leather-and-mesh construction, including a tonal mid-foot strap that syncs up through the midsole via striking contrast green Flywire. Poison Green also contrasts on the shoe’s inner-bootie which delivers sock-like fit to provide for natural motion. The outsole employs all-surface traction, with encapsulated Zoom Air in the heel for cushioning. Available in select stores Thursday. Check out Release Locator for stores. Print article This entry was posted by hhcblog on May 14, 2014 at 2:50 pm, and is filed under Footwear. Follow any responses to this post through RSS 2.0. You can leave a response or trackback from your own site.